Hagerstown Canteen Service is the ultimate full line vending solution for your Martinsburg business. Our exceptional customer service doesn't rest. We are available 24 hours a day, 7 days a week to deliver name brand quality products, office coffee solutions and clean, and crisp filtered water right to your employees. Vending machines, office coffee, and water delivery and filtration are our areas of expertise, and we're the best choice in Martinsburg. Vending machines have gone through many changes in recent years. The new technology that has come out has turned the ancient machines of old into modern machines capable of delivering everything from ice cream bars to full meal entrees. Our vending machines are more attractive, dependable and energy efficient than ever before. Hagerstown Canteen Service installs, fills, keeps your vending machines filled and serviced at no charge. Vending options include subsidized vending, free vending and Micro Markets for your Martinsburg location. You decide what best meets the needs of your employees in Martinsburg, not us. 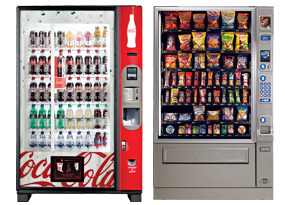 Then we'll customize your vending equipment to dispense the items you want for your employees. Coffee! Coffee! Coffee! If you don't have it, you need it. If you have it, but it isn't very good, we've got the solution! We bring in name brand coffees and brewing equipment along with all the other necessities fully stocked on your break room shelves for your immediate use. We will provide cups, creamers, sweeteners, plates, utensils, napkins, paper towels and flavored teas and hot chocolate. You'll never have to run out for supplies or hear employees complaining about the lack of coffee ever again. With our single cup brewing systems, they can get a fresh brewed cup 24 hours a day. Hagerstown Canteen Service can also install water filtration at your Martinsburg office to supply an endless stream of great tasting water. Have hot or cold filtered water whenever you need it. The only thing left for you to do is contact us at (301) 223-8000 or info@hagerstowncanteen.com.